This is our outdated writing guide. We’ve updated our contributors program, redesigned the platform, and introduced new branding — say hello to Podium! To contribute to Podium, our curated expert community, check out our new (and shorter) writing guide. In 2017 we at TNW decided to completely revamp our contributor platform. We used to have a free-for-all platform which sometime led to the discovery of new voices and topics, but it also produced a lot of poorly written articles. That’s why we created a new contributors section on our main site, giving contributed articles more exposure while simultaneously enforcing stricter guidelines. We’ve been extremely happy with the results so far because this new method has given us better articles and brought in perspectives that our staff writers didn’t have. But that doesn’t mean it can’t get better. That’s why I’ve put together this guide, along with the TNW editorial team, to give detailed information about how our program works so that people like you can help us make it better with interesting new contributions. This guide is meant for first time contributors, any type of intermediaries (such as PR peeps), our frequent contributors — the amazing ‘TNW Contributors’ — and anybody else that has an interest in our contributor platform. I’ll start with the broad strokes — how you should write, about what, etc. — and then slowly move one to the nitty-gritty of the process — how you should send in your drafts and our tiny but incredibly important copy/spelling styles. We’ll continue to perfect our platform and our process, so I’ll keep updating this guide from time to time. Therefore it’s a good idea to read through it again every once in a while. But enough blabbering, let’s get started! TL;DR: Nope, you’re not getting away that easy! You have to read the WHOLE thing if you’re thinking about contributing. We won’t even reply to submissions if it’s clear the sender didn’t read this guide carefully. Why have a contributor program at all? Our staff writers are awesome, that’s a fact, but they don’t know everything. They don’t have time to get into the expert details of various tech fields and often don’t have the hands-on experience. That’s why we have a platform where we can have experts from various industries share their original insights with our readers, bringing them fresh and new perspectives. TNW is also all about creating communities, we started with our conferences and now we want to explore how we can do that with the contributor platform. We’re looking for experts who want to become frequent contributors, as well as to establish relationships with PR intermediaries. However, we’re going to set the bar high, and only say ‘yes’ to awesome and insightful writers. Possibility of discovering new talent: writers, speakers for our conferences, etc. So far we’ve had great experiences with new contributors and built great relationships. But now it’s time for the stuff that matters most, how to actually write a good post for TNW. The topics of the articles on our contributor platform vary greatly, which is awesome, but it’s important that they all share the ‘TNW tone.’ Every contributed post should be written in a personal and informal tone, both to make it more fun for the reader and to make it stand out online. There are thousands of articles out there on tech, business, and related topics that are written in a boring, impersonal, and technical style — so there’s not really a point to keep adding to that scene. What we want to do instead is to publish articles that approach technically complex matters in a ‘human’ way. To simplify: we like writing about robots, but we absolutely despise reading a text that looks like it’s been written by one. You should try to write in a similar tone that you’d use when explaining a topic to a friend, who isn’t an expert in the field. That doesn’t mean you have to dumb everything down — as many of our readers are experts — it just means that you should loosen up your style. Many people worry about not appearing respectable or serious enough if they write in a more relaxed manner, but those kind of worries don’t belong on TNW. Writing in a stiffer and more rigid style doesn’t mean you’re better in your field, it’s almost the exact opposite. It’s easy to imitate the jargon heavy-discourse of most industries, but it takes real knowledge to write about topics in a ‘human’ manner that bridges the gap between experts and the general public. We’re looking for experts to share their insights in a personal voice, as an individual, instead of on behalf of a company (as any kind of promotion is strictly forbidden on the platform). So it’s important when you contribute to TNW that you completely ditch the boring and jargon-heavy b2b writing style — or the overly positive and salesy PR-style — and start writing like a real person. The first step in adopting an informal and personal style is to always use contractions and not to shy away from using personal pronouns. You can address the reader directly and share your personal insights and experience, e.g. “When I first started out, I found this particularly useful,” “I’d recommend,” etc. Now that you know more about ‘how’ we want the articles written, let’s get into the ‘what’. What should the articles be about? How should they be angled? We’re a tech website, so basically anything that has something to do with tech — AI, cybersecurity, design, UI/UX, cryptocurrencies, social media, programming, tech regulations, big data, privacy, etc. — can work on TNW. On the contributor platform we also cover other topics such as business, marketing, entrepreneurship, and other related fields. However, saying exactly what topics we’d like to be covered within those massive categories is extremely challenging. We definitely want more design and dev related posts, but the point of having a contributor platform is also to publish more varied content on our site, possibly something that we wouldn’t have ever thought of ourselves. That’s why I don’t want to dictate too much beforehand what kind of topics you should choose, but the most important thing is to focus on your own area of expertise. We’re looking for contributors who are experts in their field and that can share their insights in a fun and informative way. 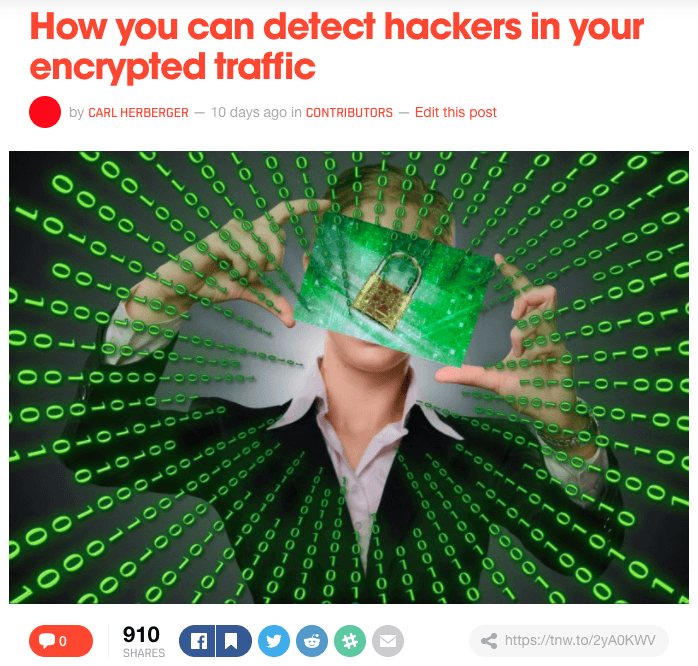 To clarify, an ‘expert’ of course refers to your profession — like cybersecurity researcher, developer, content writer, business manager, scientist, etc. — but also to your cultural insights. We at TNW love to get original and well-formed insights from new regions and culture. For example, it’d be awesome to have someone that can provide our readers with insights from the amazing Chinese tech scene, which remains mystery for most Western readers. We’re a news site, but the contributor section is more for insightful content, like thought leadership (kind of an empty word, right? ), opinion pieces, deep dives, guides, explainers, etc. It offers a chance to change gears and look at topics in a broader context than the daily news cycle usually allows. So when you’re trying to come up with a topic, think about what you feel needs to be highlighted with in your field, that our readers would enjoy. It can be pointing out problems, identifying trends, or giving advice you wish you’d had when you were starting out. You can also write about the fundamentals, which might feel basic and too obvious to you, but it could still be new and interesting to our audience. When it comes to advice posts or guides, we often see the tendency to make it into a listicle, like ‘5 tips for blahblah’ or ‘3 things you should do to blahblah’. Some listicles might work, but it just feels like the web is saturated with them and they can come off as empty and superficial. Also, how do you usually read listicles? You just basically skip over the whole thing and only read the subheads and then move on with your browsing. That’s why we like to advise people to alter their angle and focus on only one or two aspects. Not only does that make the article more concise and coherent, but it also helps it to stand out. ‘5 tips’ doesn’t give the reader much to go on, but pinpointing a particular method/issue/trick/aspect/trend/quality and what it means in a title can convince the reader to actually click on the article. Another benefit from splitting up listicles is that you can then maybe get a few interesting articles out of the same idea which would’ve resulted in only one listicle. And making articles more concise and clear isn’t only a problem for listicles, it’s something you always need to keep in mind. You should always know what it is that you want the reader to have learned once he/she has read your article. When you have a clear idea what the core or essence of your article is, then you can reflect it in your title, intro, and the structure of the article. Of course it can be necessary to include more perspectives and widen the scope for some topics, but having a clear ‘core’ element helps those articles as well. You can use the core as an anchor, a clear starting point for the reader that creates the context for further widening of the scope. Now we’ve pretty much covered the huge and vague concepts of article writing, tone, and angles, so let’s move on to the more specified parts. Titles are extremely important because they’re your first chance to convince people to read your article. However, making an enticing title is extremely difficult, especially because there isn’t any magical formula out there. It would be wonderful if we could tell you what a good title is here, but we can’t, so you’ll have to make do with some pointers. The first and foremost pointer is completeness. Out of respect for your reader you want them to know as much as possible about what he or she is going to invest time in. This might run contrary to what you think you know about withholding information to arouse curiosity, but trust us — coyness only serves to set up your reader for disappointment. Aside from completeness, specificity is also important. Instead of focusing on a big-picture concept, it might be better to highlight a detail that brings that concept closer to the reader. This could be either a striking detail from the text (‘this banana analogy helps everyone understand blockchain’), or a detail about the reader (‘… for people who are afraid to ask about blockchain’). The final pointer to keep in mind is that triggering emotion — positive or negative — is a powerful tool. Is there something your text that could make someone happy/angry/scared/exctatic/outraged? Use it. Unnecessary question marks at the end of titles that start with why/how/etc. This is mostly for our ‘TNW Contributors’ — who have access to our CMS — but the absolutely worst mistake you can make is publishing a title that’s not in sentence case!!! We at TNW despise title case, it’s terribly ugly, so please get this right — and this also goes for subheads. Speaking of subheads! I personally like to add subheads to help the reader follow the general argumentation of the article — to give him/her clear way points throughout the piece. I mean, can you imagine reading this guide without any subheads? Subheads are absolutely necessary for a humongous guide like this one, but also great for 600-1,000 word pieces. I recommend to have subheads longer than a couple of words, and it’s also to indicate your stance, opinion, or what feeling you’re trying to invoke. It’s fine to have subheads every three or four paragraphs, but it of course depends on the topic what works best. But keep in mind, we only use Heading 2 on our site, so don’t write a piece that need multiple layers of subheads. However, one final thing regarding titles. Although I’ve added title guidelines, it doesn’t automatically mean that we’ll use your original title. We reserve the right to change the titles of contributed articles to make them more appealing, descriptive, fun, and to make them fit better in with the rest of TNW. So if that’s the case, why bother with having advice on how to do titles in the contributors guide? Well, although we might change or tweak some titles, it’s always better if the article has a good title to begin with. Having a good, clear, and intriguing title means that you know what’s the ‘essence’ or ‘core’ of your article. That means your article is more focused and helps you with creating a clear narrative thread throughout the article. But now it’s time to get into the other major component of the ‘first impression’ of your article: images. We all know that featured images and titles are extremely important as it’s usually a combination of both that makes us want to read an article. A boring image with a great title — or a great image with a boring title — won’t get opened by most humans. There are quite a few sites that provide free images that don’t need accreditation, such as Pixabay, Pexels, Unsplash, and Passel. Then you can also check out lists of free stock photo services like this one. And finally, you can of course search Flickr and Google, if you use the right settings (free to use, etc.). However, the downside to using free images is that A LOT of them have been used before, both here on TNW and elsewhere. That’s why we encourage people to try to add a bit of originality to their photos, which they can either create from scratch or use free images as building blocks for them. I know this might seem daunting, but I myself have had to make my own images without any artistic skills and it’s actually way easier than you might think. That’s why I suggest you try your hand at doing simple and clean animations, especially for those of you who have rudimentary Photoshop/Paint skills, or just make collages out of free images. I’ve gathered a few examples to give you a better idea about what kind of images you can make. These three images are an example of simple original images that catch the eye. 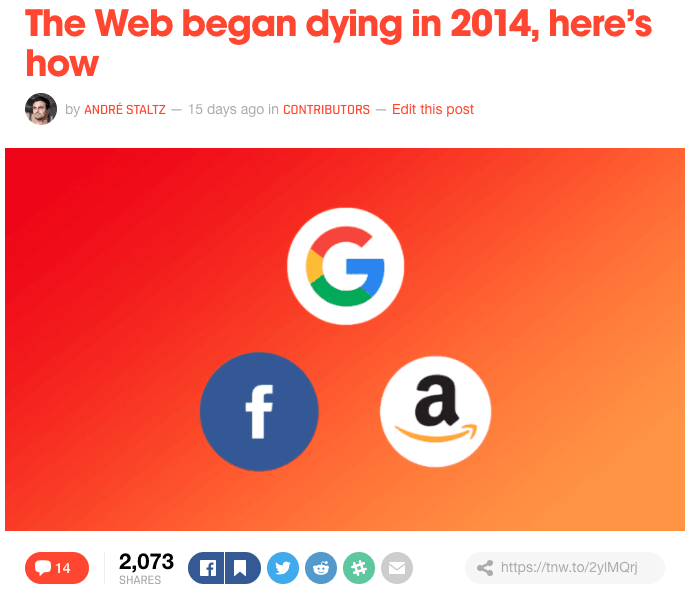 The first one adds an extra layer of information to the title as the main reason behind the death of the web is the actions of those three companies — Facebook, Google, and Amazon. Therefore this really simplistic image actually adds a lot of info and catches the eye of the reader because it’s new. 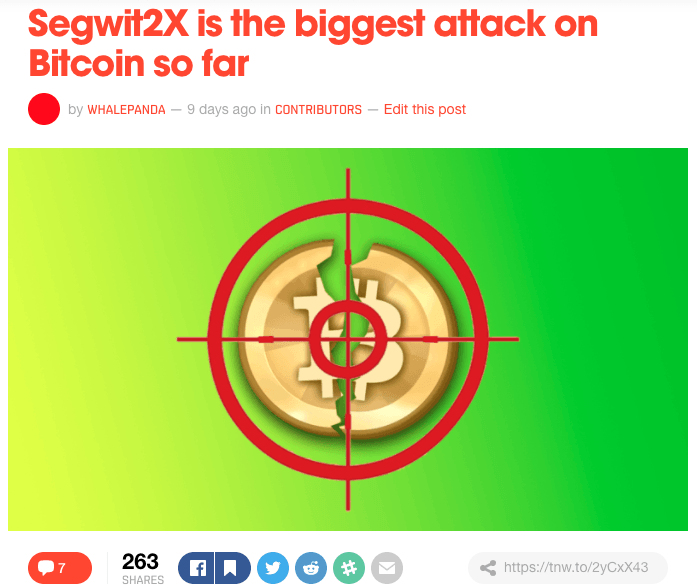 The other two are quite similar, just small tweaks to the Bitcoin logo that are in line with the topic of the article. As you can see all the backgrounds are gradient, which give the image a bit more ‘life’ and make them more dynamic. These five images are all example of ‘collages,’ where pretty standard free-to-use images are enhanced with other stock photos. There’s much more to say, but it’s easy to find photos of basic objects without any background — making it extremely easy to add them on top of other images. 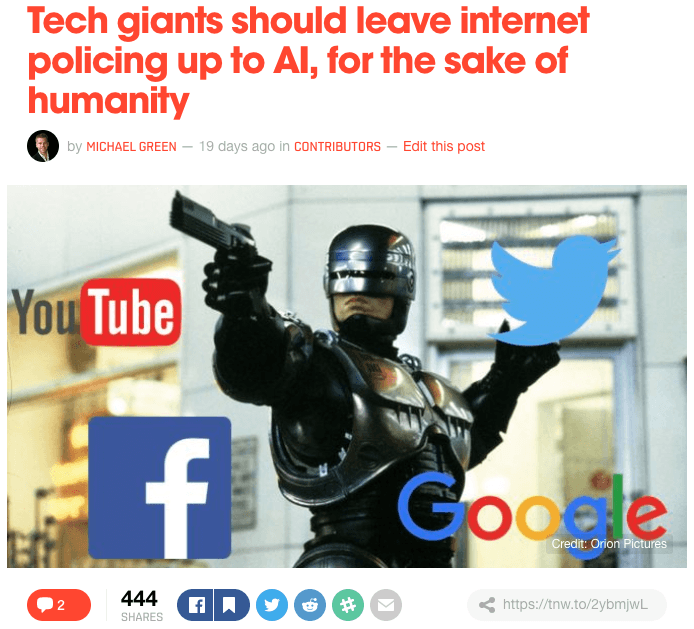 The last three articles — about AI policing, the need to reform surveillance in the US, and losing our privacy — are quite serious, but that doesn’t mean that they need to have boring featured images. In our experience, having original images is always better and can help to make serious topics more accessible. These three are examples of the wackier images on our platform. The first two have been edited, but they’re all based on really weird free-to-use stock photos. There’s not really a whole lot I can say about these images, it’s mainly to show you that it’s okay to get little weird. The one with the ‘folder-face’ might have crossed over the line between funny and crappy (I made it), but working on that border can work from time to time. It’s fun to take risks sometimes. And finally, here are a couple of images that we thought were really cool. The image for the SoundCloud article looks really great but was actually extremely easy to make. It’s simply a matter of finding a great looking background and then images of the logo without a background. 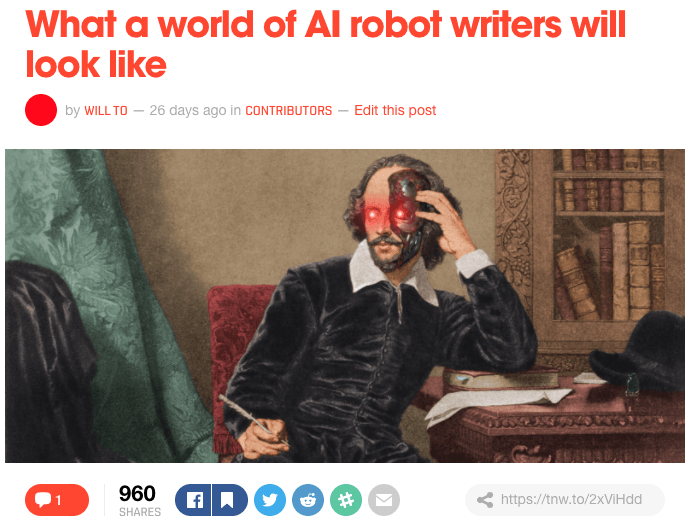 The Shakespeare-image for the piece on AI writers is also amazing and I’d love to see more images like this one on the contributor platform. However, it does undeniable require more advanced Photoshop skills. But if you do happen to possess such skills, definitely don’t hesitate to do some original featured images for your articles. Then before we move on to the next section, it’s important to mention ‘in-article images’. We definitely encourage contributors to include images (graphs, stats, etc.) in their posts to add more life to the post as well as information. You just have to make sure that the images are accredited correctly and make sure to include ‘image credit name’ and ‘image credit url’. Or you can just make your own, like the contributor did in this article. Now we’ve covered the basic exterior of your article, what’s visible to the reader before he/she decides to actually click on it. Now it’s time to move on to the actual content of your article and what you need to do to woo the reader. I can’t stress enough how important it is to have a well-written and engaging intro. The first two paragraphs are your chance to convince the reader to actually read the entire article after having opened it. So make sure you explain or hint at what’s original about your article — because that’s the reason why they should read on. That’s why you shouldn’t waste your first couple of paragraphs on dry stats or an overly broad view of the topic/field. Don’t bombard the reader with stats, save them until later to support your argument, instead of having them ‘be’ your argument (because that’s never original). You should also skip the ‘once upon time’ part of your article. We all know, for example, that social media has changed the way we communicate, or that technology has evolved immensely, so there’s no need in wasting the readers’ attention with that rubbish. Start right away with what makes your article original, because that’s what keeps them engaged. An easy way to do this is to remember that you can almost always delete your first paragraph — you’re the one who’s warming up to the story when writing it, not the person who’s going to read it. But if you have none of the above, no problem. Try to summarize your core idea in one sentence and use that. If you can’t summarize what you’re trying to say in one sentence, then that’s often a good indication you should simplify your article. Writing intros is hard, but trust me, it’ll be worth it in the end to spend time on making them as perfect as possible. You need to make sure that the main body of the text has a clear narrative structure and that the reader is fully informed about where you’re argument is leading. Remember to use descriptive subheads and images to make the article livelier. If you have trouble structuring an article there’s a simple method you can almost always apply. Let’s take a basic building block, the paragraph. Each paragraph should contain one main idea you’re trying to get across. In this case, it’s the simple method to build a paragraph. Now have a look at the previous paragraph. The first sentence introduces the reader to the main idea of the paragraph. The following two sentences elaborate on that idea, and the final sentence wraps it all up and sets up the next paragraph. This structure can be now applied to every element of the article. When starting a sub-heading, make sure the first paragraph explains the subject of the sub-heading. Elaborate on that idea in the next few paragraphs, until the final paragraph, which summarizes the idea of the sub-heading, and sets up the reader for the next sub-heading. Finally, apply that same method to the whole article, and make sure that the first paragraph introduces the whole story, and the conclusion wraps it all up nicely. Conclusions are also a great way to cement what the reader is supposed to take away from the article. This can be done in various ways but one way to do that is to mirror the intro in some ways. Of course this is just one method, and we’re totally open for creative use of structuring to tell stories in less traditional ways. Regarding general structure, what you need to keep in mind is the paragraph length. As you can see after reading a few of our articles, we at TNW use really short paragraphs, usually no longer than three to four sentences. The entire length of the article, however, should be around 600-1,000 words, depending on the topic. We’re now entering the minefield. One of the major challenges of writing for the contributor platform is getting the use of links right. What’s most important is to not have any promotional links at all, self-promotional or otherwise. You’re not allowed to link to your own company, blog, etc. — and it’s strictly forbidden to sell or provide promotional links to others. Even if you’re not intentionally promoting or selling coverage to a company, then you need to make sure the article doesn’t come off as a paid post. That’s why it’s best to stay away from writing about little-known startups or companies, because it will almost certainly feel promotional. Our staff writers are better equipped to write about those because it’s usually ‘news’ and we can make sure it’s not paid coverage. But let’s stop the negativity and start talking about the links you should use. Having links to trusted sources adds credibility to your writing and provides additional information for curious readers, but be careful with how much of the text you hyperlink. Try not to cover more than four words, because otherwise it can look a bit sloppy and make the text less appealing. Links are supplementary to the text, not the main dish. This is extremely problematic, especially when over 80 percent of iPhone users don’t know how to use other operating systems. Of course there are some cases where the origin of the stats/quote/statement matters — mostly when referring to stats/quotes/statements gathered by other publishers — but you should try to minimize the unnecessary clutter in your text. Make it easier for the reader what actually matter to your article, and what’s added value. I know that this guide is insanely long, but worry not, we’re on the home stretch. I know this might seem miniscule and not particularly important, but it’s extremely important for the overall aesthetic of our site that everybody follows the same copy guidelines. I usually fix these minor inconsistencies myself, before publishing a contributor article, but if a post perfectly adheres to these incredibly specific guidelines, then it’s even more likely to get published! Also, I will like you! Subheads and titles in sentence case — I can’t stress this enough, extremely important! Examples of spelling: blockchain, internet, web (all lower-case), ecommerce, esports, edtech, fintech, etc. This isn’t an exhaustive list, but it covers the basics and should help your text to match the rest of TNW. For any other language-type concerns, please refer to the AP Styleguide, which we strive to adhere to. Even though this is the best writing guide that’s ever been written (right? ), it’s always challenging to do as the guide dictates. That’s why this part is about ‘showing’ rather than ‘telling’, giving few examples of what articles we liked, what could’ve been better, and most importantly, why. These examples aren’t in any particular order (except for the first one) and aren’t necessarily the absolute best on the contributor platform. There’s a lot of good articles on our platform that aren’t here, but I’ve chosen these articles because I think they can provide good examples for newcomers. 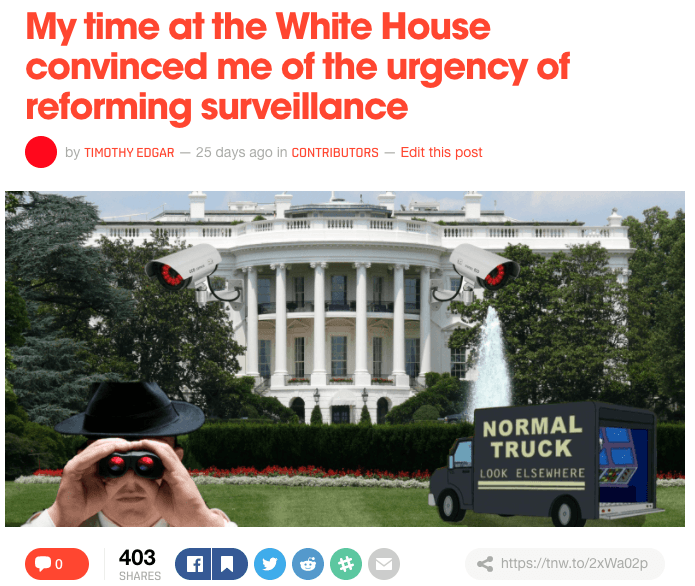 The ‘big brother’ article on Facebook is the most successful contributor article up until now, with almost 300,000 views. It might sound weird, but the article could have been better. The style is a bit rigid here and there, the tone could be more personal, and the image could be more enticing. However, the article made up for that with a detailed expert explanation of a process that most people already suspect is going on. The lesson is, content can overcome superficial faults if it’s amazing enough, but it’s better to make the writing as good as possible — just to be safe. The other articles are similar in this respect, awesome content but could have done even better with a more appealing tone. We really like these kind of topics and that’s why it’s so important that they’re written in an engaging manner. These are big concepts that affect all of us in some way or another, that’s why we want as many people as possible to read about them. In addition to thought provoking posts, we like to publish articles with clear serviceable elements for our readers. A great way to do that is to have plain-English guides on complicated topics. They don’t have to be for complete beginners and it’s fine to get technical, but as always, it’s really important to have a light tone. Guides can also do great for SEO and are likely to work as ‘evergreens’, giving you steady views over a longer period of time. The first two examples are long and detailed guides (2,000-3,500 words), featuring great original images to help the readers understand complicated topics. In longer guides it’s absolutely essential to have an informative intro along with a good summary in the conclusion. However, guides don’t have to be as intense and detailed as the first two, as we can see in the one on how to prepare of the cryptocurrency revolution. Also, they don’t need to be about crypto-related topics, it just so happens that those are most in demand at the moment because people are trying to wrap their heads around this new and emerging field. The final guide is a great example of what a non-cryptocurrency guide looks like. What’s great about it is that it’s based on the writer’s actual experience, which allows him to use a personal tone in the article. However, this post was really close to feeling too promotional, but it managed to stay on the right side of the line by not linking directly to the company that tested out the tips. We’re always on the look out for more fun and wacky stuff, especially if it can serve as an example of a bigger topic. The first example of this is a lousy Super Bowl-betting AI that underscored the problems AI faces when it comes to cybersecurity. It’s a great and innovative angle to approach cybersecurity, but there’s just one problem, that wasn’t the original title. 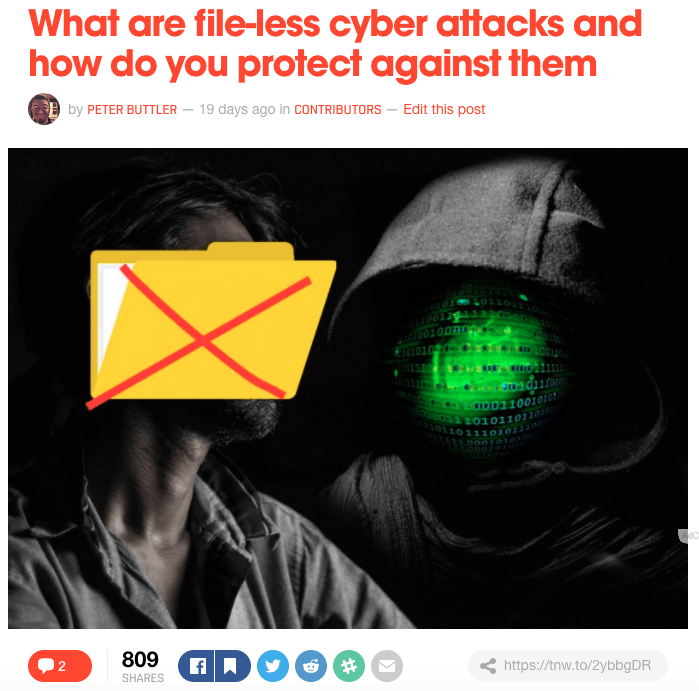 The article is pretty much the same as the original version, but the original title didn’t include a betting AI — it only referred to humans being indispensable in cybersecurity. That means that the article isn’t as focused around the AI as the contributor could’ve made it, somewhat missing out on a strong and fun narrative thread to elucidate the challenges of cybersecurity. Always think about whether there’s a better way to focus your story. The other two articles — data analysis of Game of Thrones and UI in ‘8os sci-fi movies — are quite silly and written for the reader’s amusement. The writing could be improved upon, but the fundamental ideas behind the articles are great. As we’ve established in this guide, news reporting is done by our staff writers, but that doesn’t mean you’re not allowed to have your take on current events. Here are four articles that provided original takes on topics that were prominent in the news, without being overly timely (keep in mind that it can take up to six weeks to review first submissions). The Bodega article went a step beyond the outrage and tried to identify the possible reasons behind the massive negative reactions to the startup’s plans — e.g. disruption and non-diverse hiring. The article does well at summarizing the discussions and takes it one step further, which is often not possible for those working in the 24/7 news cycle. Of course all articles can be improved, there’s no such thing as a perfect text. The intro feels a bit like ‘once upon a time’, but it’s really hard to change that when directly talking about recent news event. The title could have also been a bit more aggressive and unique, to better convey the original insights of the piece. However, the writer does state clearly in the intro what the reader can expect in the article, which is really good because it may spark the reader’s curiosity and make him/her want to read on. The Bodega story also has a hint of a personal tone by employing personal pronouns to describe the writer’s stance, without overdoing it (self-promotion, etc.). 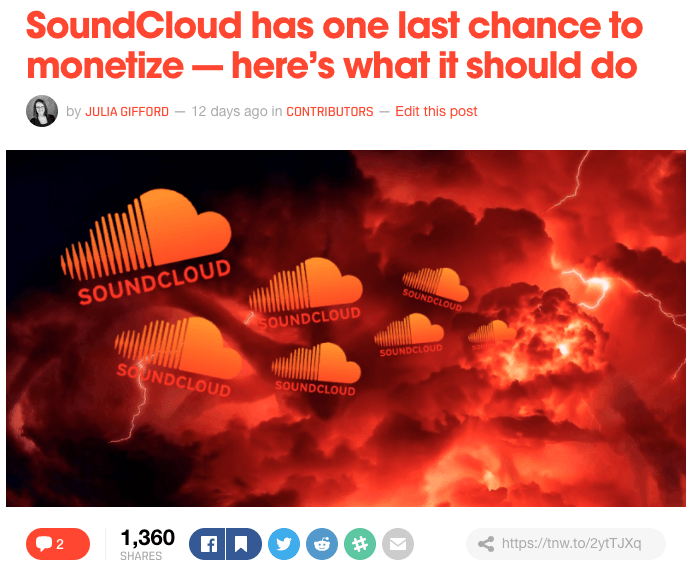 The SoundCloud article is a bit different to the Bodega piece. Both provide a deeper inspection of topics after they’ve dominated the news cycle, but while Bodega is based on an individual’s perception, the SoundCloud one is based on data gathered by a startup. The last two show how contributors can present their ideas and interpretation of initiatives made by big and well-known players. The articles are clearly not promotional as they’re centered around a fresh and original take. Now let’s move on to the final batch of examples. We receive countless submissions about these types of topics, but we only end up publishing around five percent of them — and that’s a generous estimation. The problem with most of them is their tone is usually too rigid, lacks focus, and frankly, sometimes they’re just plain and dull. The articles need to be ‘human’ or have a clear serviceable element, like guides or explanations. No article in history has ever been read by a company, articles are read by humans, so please think about how the topic relates to people and focus on that. The lack of focus is often caused by attempting to cover a part of the industry that’s too broad to cover in one article. This results in a lack of any kind of ‘hook’, which is essential to get people interested in reading the article. Remember, this entire program, and all of TNW, is about providing interesting content for our readers. The top example here above has a great hook: what does it mean to be a ‘mini CEO’? It makes the reader curious, without being a click-bait. However, the problem is that this isn’t the original title, similar to the article with the Super Bowl-betting AI. The article did well but probably could’ve done even better if it was clearly centered around the ‘hook’. 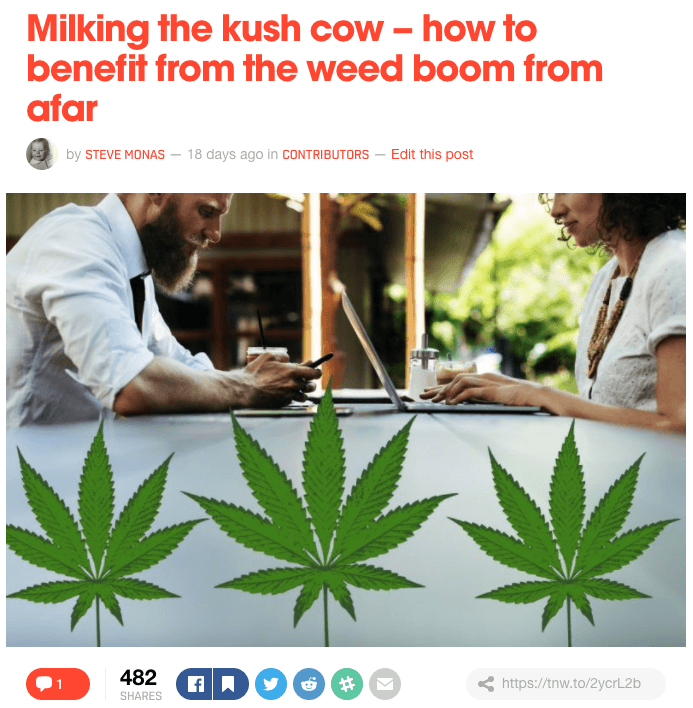 The second example isn’t necessarily the most engaging piece of content but it makes up for that in some ways with a weird and unique image — which helps the article stand out. The topic of the article might be important, but remember, you need to do everything you can to convince the reader to care about it. The best way to do that is to employ a personal tone and cut through the noise. The third article is a good example of trying to provide an original angle. The tone is personal and informal (just the way we like it) and the contributor manages to twine together really different topics: painting and product management. This approach humanizes the project and makes it more accessible to the general reader. 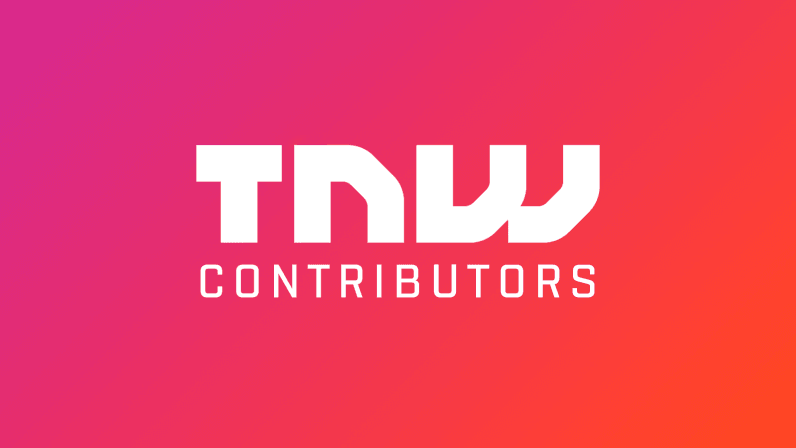 Finally, what you’ve all been waiting for, how to actually contribute to TNW! The most important thing about applying, is making sure that you’ve read this guide carefully and that the article matches our criteria! Also, to reiterate, we’re mostly looking for expert contributors who want to contribute frequently — or establish partnerships with intermediaries (PR peeps, etc.) that can make sure that the contributors they represent will fulfill our criteria. And keep in mind, we get an incredible amount of articles sent to us, so we’re only looking to publish the truly great ones, not those who are just ‘good’. Emails from people that clearly haven’t read this guide or look shady (bad spelling, weird emails, etc.) won’t be answered — but enough negativity! You can send your finished article to us at contributors@thenextweb.com, with the article attached as a Google doc. Short author bio — can include self-promotional links: blog, company, etc. The full article — subheads, images with proper credits, etc. In the email you should write a short message, introducing yourself (or the author you represent), what you do, and why you want to contribute to TNW. It’s also good to add full-resolution versions of the images you used in attachments to the email. Once we reply that it’s been added to our queue, it can take up to six weeks to review (not counting holidays). I know that this might seem like an extremely long time but trust me, if you’re looking to make your mark, it’s worth the wait. The good news is that it won’t always be six weeks, that’s mainly for first time submissions, but as your partnership with TNW grows, the quicker the review process becomes. Once a contributor has submitted three to four great articles in a row and we’ve built some rapport, then we can consider making him/her a ‘TNW Contributor’ — which have direct publishing access and can log into our CMS. If you want to submit another article while your first one is being processed, then send the new one in a separate email chain. However, I don’t really recommend this as there can be fundamental mistakes in the first piece which would probably be repeated in the second one. Keep sending great content and become a ‘TNW Contributor’! Congratulations on reading all the way through this monster of a guide! I hope you found it helpful and I look forward to reading awesome articles by our ever-growing TNW community.